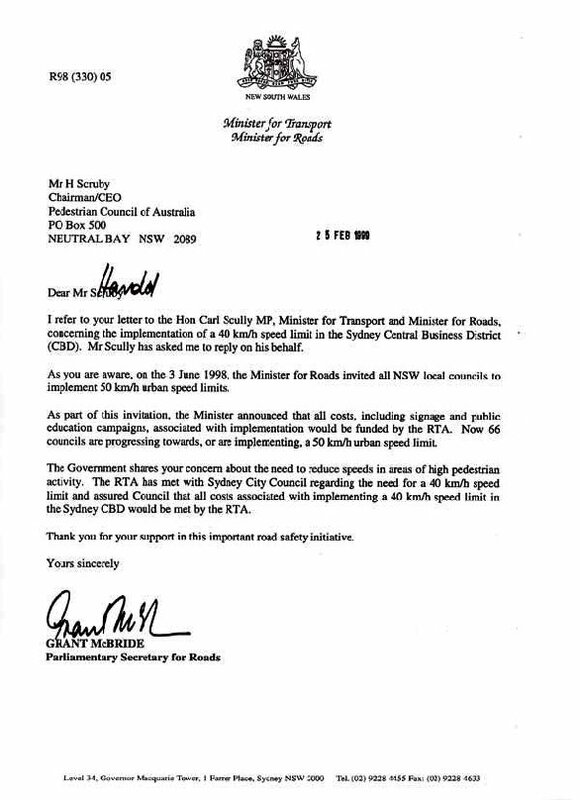 The Chairman of the PCA, Mr Harold Scruby, today called on the Lord Mayor of Sydney, Councillor Lucy Turnbull, to declare Sydney’s CBD a 40 kmh zone. In congratulating Councillor Turnbull for her decision to extend the tram-line from Central to the Quay, Mr Scruby said: “It is now time to make the CBD a safe and pleasant environment in which to shop and work. 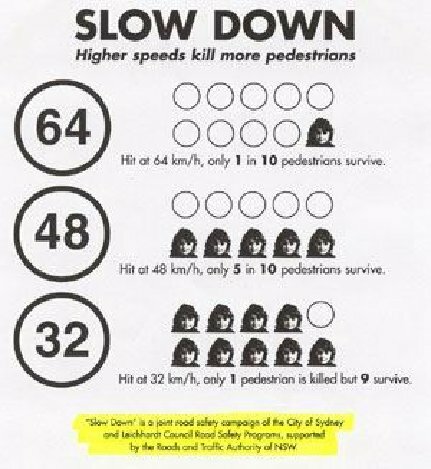 The PCA has been lobbying the City of Sydney for over 5 years now to reduce the speed-limit to 40 kmh, without success. 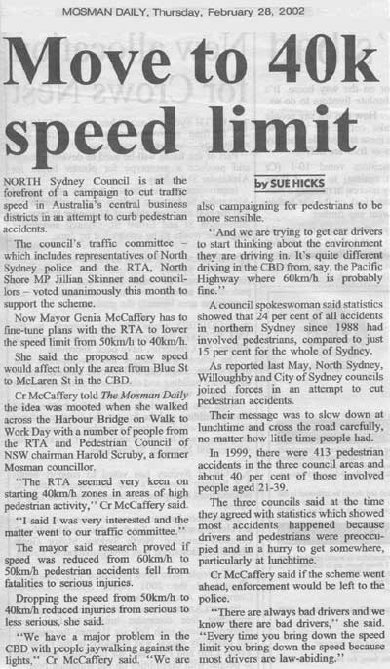 However, we were successful in convincing North Sydney Council of the huge benefits of a 40 kmh CBD zone and this will come into effect next week. Now that North Sydney (which is the fourth largest CBD in Australia) has set the precedent and because of the new tram system and the cross-city tunnel, it is imperative that the CoS embraces this initiative. There are still far too many deaths and serious injuries in the Sydney CBD and Police have recently expressed their serious concerns about the CBD Road Toll. 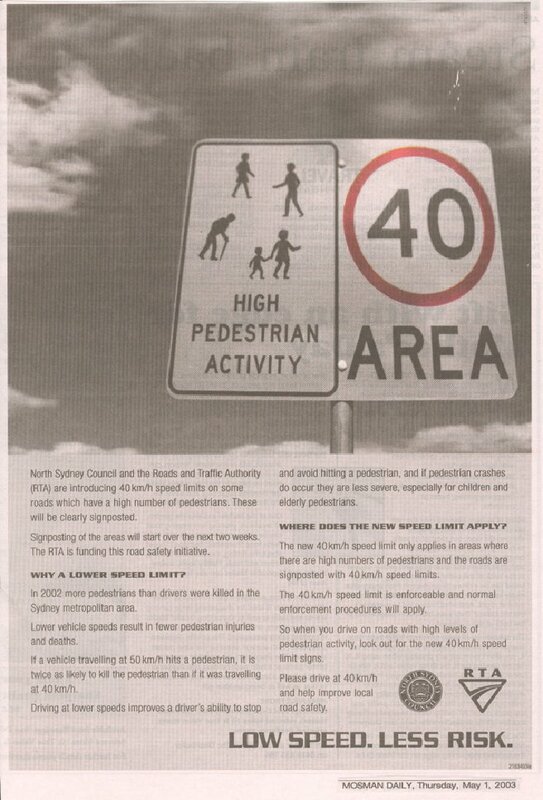 The new ads being placed in the press by the RTA state that pedestrians are twice as likely to be killed when hit by a vehicle at 50 kmh than by a vehicle travelling at 40 kmh. The Sydney CBD is already surrounded by both Darling Harbour and The Rocks which are both 40 kmh zones. 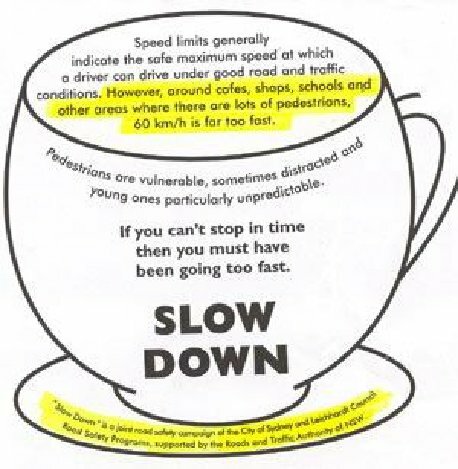 While there are those who argue that most of the traffic already travels at less than 20 kmh, this is not the problem. It is when motorists speed up, often to beat the lights (at night, in the wet) that the serious injuries and deaths occur. 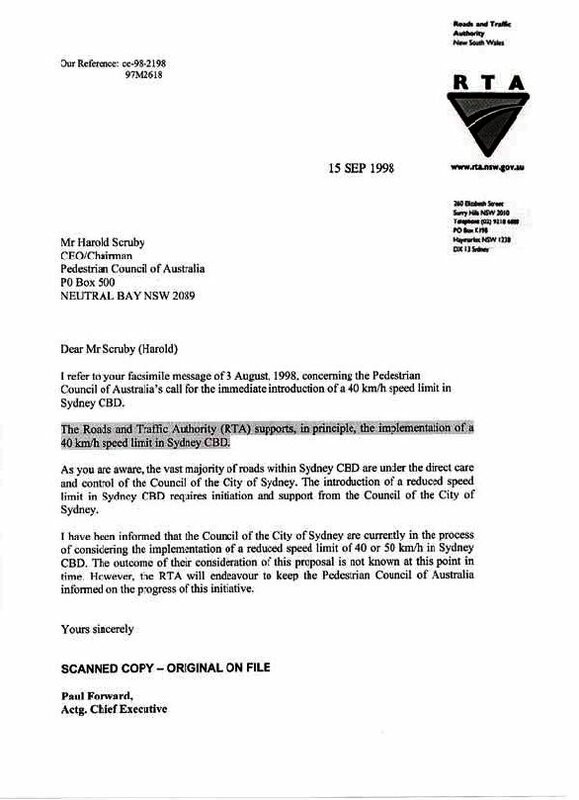 “We call on Councillor Turnbull to act swiftly and decisively and prove she really cares about the safety and amenity of the pedestrians of Sydney.” Mr Scruby added.